This season, I skied more powder than I knew what to do with. I choked on great wads of the stuff. I leapt off mushies into great pillows of it. I felt the press of powder on my chest through the tree runs. Powder skiing is hard to do. I don’t mean tiring, I mean the technique is hard to master. I watch my snowboarding friend glide over bottomless powder on his second day, green with envy. 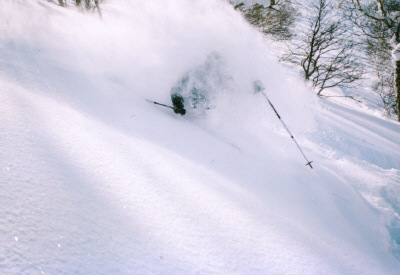 Powder skiing is effortless, but it takes time to perfect the technique, to be able to glide rather than turn between the trees, to let the set of your skis do the work for you. After two full powder seasons, I may have got it. Not perfectly, not fantastic, but intermittently graceful. 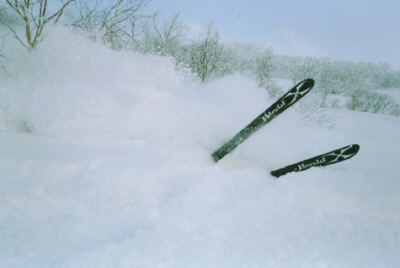 Fat skis have revolutionized powder skiing. The ski that kept the old fart on the powder slope has evolved into the main weapon in the armoury of the all mountain powder skier. It used to be you could see the difference between a skiers line and a boarders line, but the distinction has become blurred, two huge arcs swaying down a powder face. 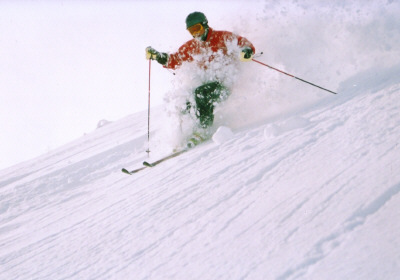 Fat skis have enabled skiers to carve in powder, huge turns, high speed, Jeremy Nobis in Alaska. That is what I do. 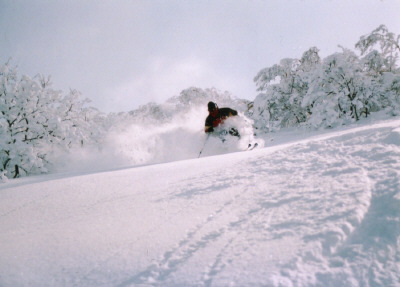 I ski powder fast, big, spoilt by the amount of snow I can access, spoilt by day after day of fresh, bottomless turns. I take two turns where the old ski purists scowls at me and take twenty. “Look at the powder you are wasting!” they exclaim. “ Hey, I’m here everyday, mate, and look how….slow you are going!” I reply. To me, the pursuit of powder turns is what wakes me up at seven thirty with a hangover and makes me get up. It is what brings me home with a smile on my face, and what made me quit my job, and make it my life. For others, there is another holy grail. It may be touring, searching for corn snow when everyone else is dusting off motorcycles. For some it is racing, speed through the gates chasing that hundredth of a second. Others like to jump, spin and grab in the park and the pipe. Junpei Endo appeared in the Teneighty ski promotional video when he was 16 years old along side the pioneers of the new school movement in skiing, JF Cusson, JP Auclair, Mike Douglas et al. 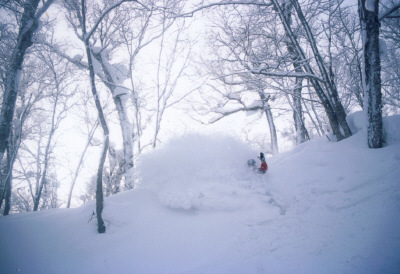 He was the golden child of Japan’s freeskiing movement. His favourite trick is a switch 720. He is twenty one and he goes big. This year he has been without a sponsor. Most of the kids you see on the mountain throwing big tricks in the pipe are riding Junpei’s signature Salomon Teneighty ski, and that is what Junpei skis on. One minor indiscretion, and Salomon dropped him. Salomon France said “Eez no problem, oui?” but Salomon Japan said “Non,” and Junpei was sponsorless. He stayed in Niseko at the 343 ski shop, and spent his mornings at the park, quietly setting the standard, throwing down trick after trick. Skiing with my friend Daisuke, we took the Kogen Number one lift that services the park. “That’s him, “ he whispered in awe, as JP’s grey clad figure spun by. His afternoons were spent waxing skis and helping at Lodge Ronde, adjacent to the ski shop, famous for it’s connection with the Japanese Mogul Team. JP, as he is known in 343, is quiet, shy almost, and polite. He shakes hands and looks me in the eye, something I am not quite used to from a Japanese person. He shows me into the dining area and offers me a seat and we talk. He is attentive, friendly, but an anachronism. He has skied with the best on the planet, thrown big tricks in big comps, but still has a child like quality, an innocence. His philosophy is simple and refreshing. “Just enjoy”. He says it more than a few times as we talk, not because his English is limited, quite the opposite. When talking about the sport he has being doing since he was three, he can be very articulate. He says it with feeling, and a broad smile. He doesn’t enjoy hiking up for powder, so he doesn’t do it. He doesn’t enjoy racing, so he doesn’t do it. He enjoys 720’s - switch 720’s, so he does them. JP isn’t completely critical of Niseko’s freestyle scene. This years big air contest saw some truly exceptional tricks from the young mogul skiers. He is also impressed with Niseko’s powder freeriders. 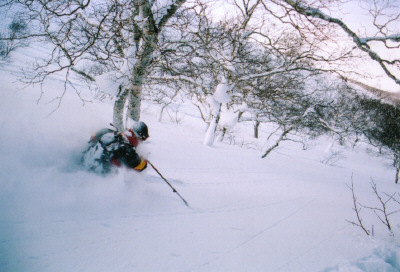 “Both boarders and skiers charge here in Niseko. I was really surprised. I guess with such consistent powder and varied terrain within easy reach of the lifts, it makes for perfect conditions everyday. The overall level of powder skiers and boarders is very high.” I asked JP what the hardest thing about jumping is. “Landing it,” he replied, smiling. JP lives and skis for the park, for switch take offs, for the “ahhs” of the crowd as the stomps another landing. He feels the stares of recognition as he gets off the lift, people whispering into face warmers. He enjoyed Niseko, the powder, the park, the 343 ski shop. His philosophy is “Just Enjoy”, a mantra to anyone, not just the aspiring pro. Japanese ski magazines are full of tips and techniques, thoughtful prose from the professional “senpai”, speaking down the masses, lecturing. English ski magazines have thoughtful articles about what skiing means to real people, real skiers and boarding magazines offer the same. Landing more jumps, going faster down steeper slopes, and getting technically more able, are admirable things to pursue, and each to their own, be it the adrenalin of a mute grab off a table top, or temporary blindness until you wipe the powder of your goggles. We all get something different out of winter sports. Landing a drop off a big rock is great, but if I am out with friends and I don’t make the landing - that is often just as much fun. Or if one of my guests calls me from hospital with concussion, that guy’s story is just as much fun. And, if someone comes back to the pension, and tells me about a triple cartwheel face plant, that is just as much fun - as long as I “Just Enjoy”.